The Russian Prime Minister also said Russia was both permitted and bound by law to honour arms contracts with the Syrian government. Russia will stay neutral on the Syrian civil war but continue to honour arms contracts with President Bashar Assad's regime, Prime Minister Dmitry Medvedev said in an interview published on Monday. UN rules bar members from backing the armed overthrow of a foreign government, therefore it is legally “unacceptable” for Russia or any other country to recognise the opposition, he said. “Despite popular belief, Russia supports neither the Assad regime nor the opposition. We're neutral,” Medvedev told French media ahead of a working visit to Paris on Monday. Earlier this month, France became the first major power to recognize the new Syrian rebel coalition as the legitimate government of Syria. Medvedev also said Russia was both permitted and bound by law to honour arms contracts with the Syrian government, which he suggested predate the current conflict. “The deliveries that we've made are of weapons for defending against foreign aggression,” he said, adding that Russia would stop arms sales if they were banned by international sanctions. The United States has accused Russia of sending attack helicopters to Syria, and last month Turkey intercepted an airplane that it said was carrying munitions to the Syrian government. Russia has insisted that it is abiding by international law. In the wide-ranging interview with Agence France Presse and the Le Figaro newspaper, Medvedev also denied that the government was “tightening the screws” on the opposition, including with new laws on treason and foreign financing for NGOs. He cited political reforms, including gubernatorial elections — albeit with presidential oversight — and easier registration for political parties as proof that the government was listening to protesters. President Vladimir Putin's third term ends in 2018. 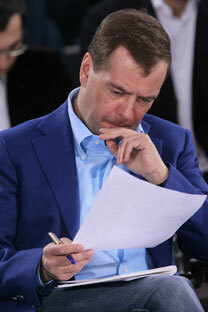 Medvedev, a Putin protege and longtime ally, is seen as politically dependent on his mentor.